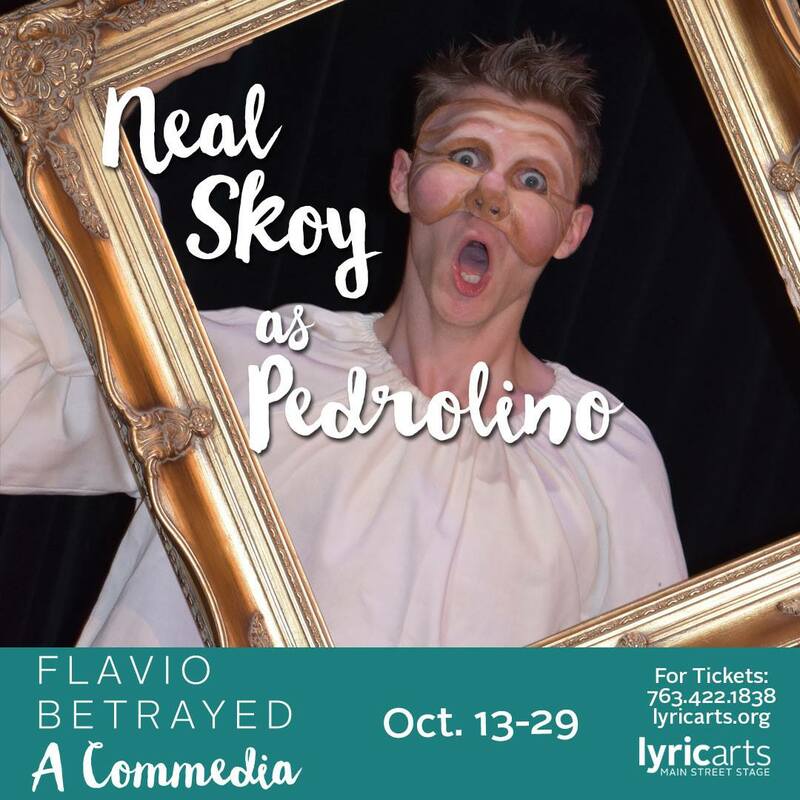 A funny thing happened on the way to Anoka, or rather, in Anoka - the world premiere* of the new play Flavio Betrayed by resident director Scott Ford, based on the commedia dell'arte style popular in 16th-18th Century Italy. He has assembled a fantastic cast that plays the exaggerated and highly stylized physicality to the hilt, extending even into some pre-show bantering with the crowd. It all makes for a perfectly silly evening of theater. In the real world, there may be tragedy tomorrow (and yesterday and next week), but there is only comedy tonight at Lyric Arts! The plot of the play is based on commedia plays of the day, and features lovers, misunderstandings, and duels. The Flavio of the title is an artist in love with the lady Isabella, whose father wants her to marry the famous Captain Spavento. Further complicating matters, Flavio's so -called best friend Oratio also loves Isabella, and plots to split them up and marry her himself. Then there's Isabella's neighbor Flaminia, who just wants to marry anyone, and her doting father. Throw in a couple of too-smart-for-their-own good servants, and you have the perfect recipe for commedia. The script is full of modern references, bawdy jokes, and occasional fourth-wall breaking. 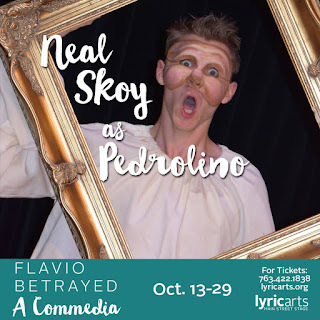 The cast plays it brilliantly, none more so than the delightful Neal Skoy as the sort of narrator/guide through this crazy romp and one of the chief servant mischief-makers. Everyone in the cast (which also includes Autumn Sisson, Brandon Osero, Brendan Veerman, Christopher Kehoe, Izzy Waid, Katharine Strom, Kyler Chase, Nate Otto, Neal Skoy, Nykeigh Larson, and Rick Wymam) is terrific in their own unique way (and several have training in this style of theater). Very big, physical, entertaining performances all, so loose and playful, with a few audience ad libs. The wacky cast is accompanied by just two musicians (Warren Sampson and Shelby Ernst) on many different instruments, mostly as a sort of soundtrack, with a few charming little songs (composed by Melissa Bergstrom). The set is comprised of three two-dimensional, colorful, cartoonish buildings, and the cast is dressed in their best Renn Fest costumes, from peasant to lady. Many of the characters wear masks in the traditional commedia dell'arte style, which has the effect of hiding the actor's face and facial expression, so they have to relay more on physicality to express the large-sized emotions (set design by Peter Lerohl, costume design by Katie Martin, mask design by Katie Kauffmann). "A commedia?! Yay!" The actors' sentiment will match your own upon seeing this broadly comedic escapist show. 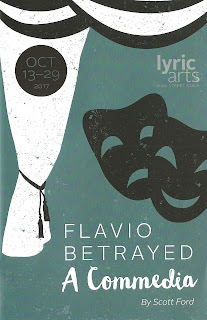 Flavio Betrayed continues through October 29 at Lyric Arts in lovely downtown Anoka. *Correction: this is the professional world premiere. It was previous performed at Anoka-Ramsey community college. 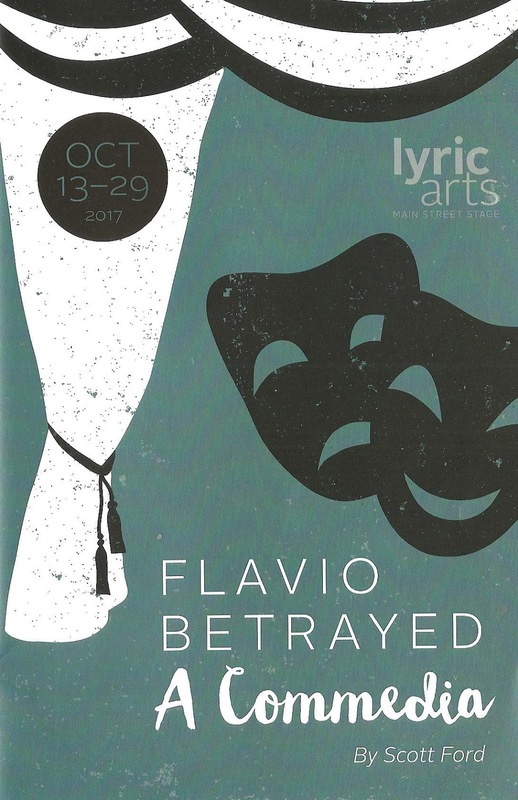 "... the world premiere of the new play Flavio Betrayed by resident director Scott Ford..."
It was performed at Anoka-Ramsey beforehand. I know community college doesn't really count, so that's fine. Just semantics and technicalities. You're correct. I believe they're calling it the "professional world premiere." Thanks!